A glass of milk, tea, porridge, bread, biscuits or muesli are a few things that immediately flash in our mind when we think of breakfast. 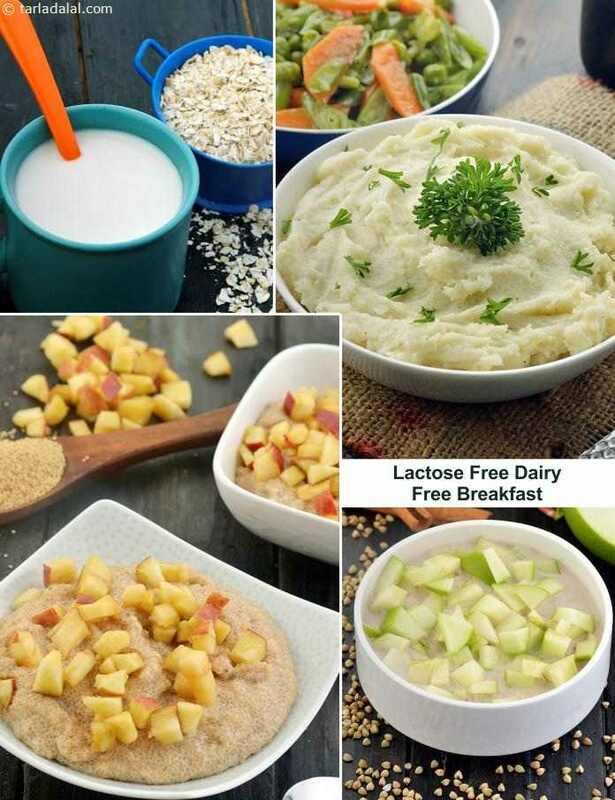 But unfortunately those who have to opt for dairy free options due to lactose intolerance have to exclude these options from their breakfast menu. But do not despair. In this section we have a few substitute to lactose rich milk. As a substitute to cow’s or buffalo’s milk, try Homemade Oat Milk, Homemade Almond Milk Made with Soaked Almonds or Soya Milk. Of course, it will call for some extra time to be spent in the kitchen, but it’s surely going to be a worthwhile affair to satisfy your cravings for milk. And once you have mastered the art of making this, go ahead and be a little more creative. Try making different porridge like Buckwheat Groats Strawberry Porridge and Buckwheat and Green Apple Porridge. On days that you want to turn to a smoothie as an all in one breakfast option try Strawberry Almond Milk and Oats Smoothie. And we haven’t forgotten to add a dairy free Whole Wheat Bread to this section. Spread Coconut Butter with Desiccated Coconut on it and enjoy it! To carry something to work we have specially designed Multigrain Healthy Cracker for you. So you will agree with us that this section has a lot for those looking for dairy free breakfast choices. While we have summoned the most healthy dairy free breakfast options in this section, we hope that you will try them, enjoy them and share these recipes with your friends who genuinely need them to enliven their breakfast too.